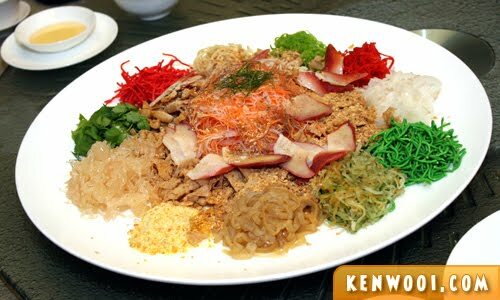 Well, theoretically my first Chinese New Year Yee Sang didn’t happen in the year 2012 itself. It happened slightly a few weeks earlier. 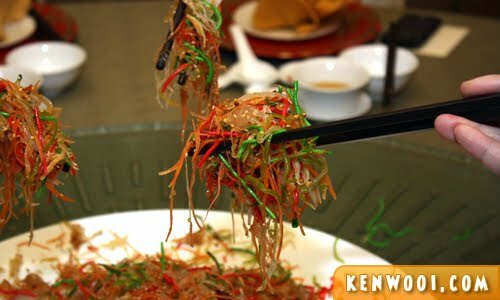 I had this particular Yee Sang in December 2011. Yes, it wasn’t even 2012 yet and I’ve already had my first Yee Sang. It was a dinner at Zuan Yuan, One World Hotel – and it was also in-conjunction with the launching of their Prosperity Chinese New Year Menu. There are all sorts of Yee Sang these days. The Yee Sang we had featured polo clam and shredded sweet turnip in truffle oil. So after topping up the condiments and everything’s set, it’s time to get messy! 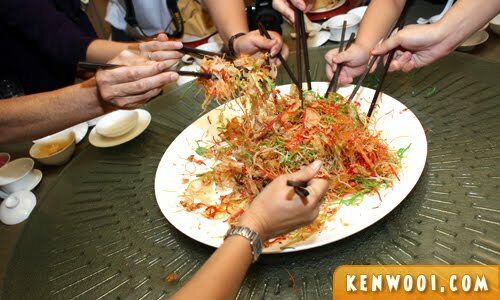 I think stirring and tossing the Yee Sang is the only time we can make the table messy, and no one is gonna complain about that! The higher the toss the better luck too! With that all done, we all stopped messing around and be seated back to enjoy the rest of the dinner. My Yee Sang plate. I have to say that I love the crunchy condiment the most. It’d be nice if I could get my hands on those individual packets. Nom nom nom. Besides the main highlight of the menu, there are other dishes as well. This is the Poached Village Chicken. 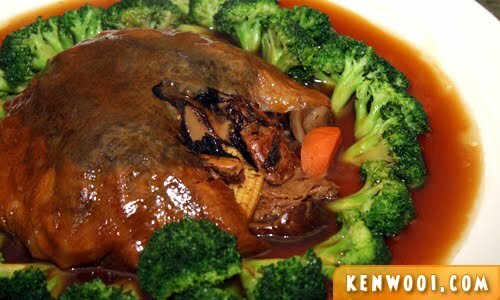 Sprinkled with prickled radish and prepared with soy sauce, this typical chicken dish is a heartwarming one. Tenderly warm, it’s certainly a dish to savour! Next one is the Steamed Red Grouper. Prepared with the ‘Medan’ sauce, it looks pretty spicy at first – but it wasn’t. 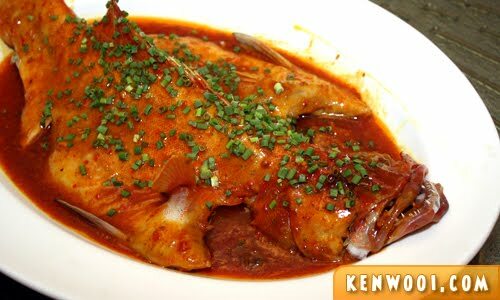 With the sauce tastes almost resembling the ‘sweet and sour’ flavour and the fish cooked to perfection, everyone on the table unanimously enjoyed it. 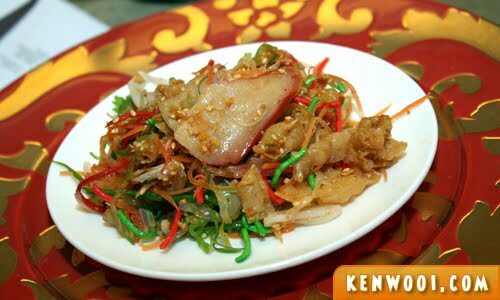 Another dish we had was the Wok-Fried Butter Tiger Prawn. 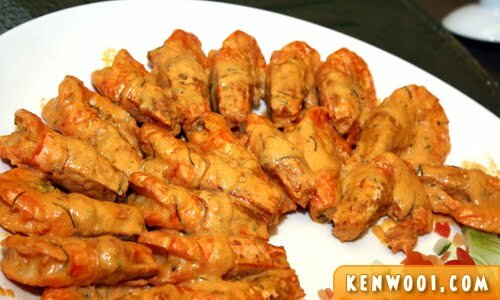 Coated with thick creamy papaya and milk sauce, the prawns are definitely garnished nicely. Instead of just removing the shell and put it aside, this dish allows us to enjoy a flavourful taste even before we reach the meat. And the last dish we indulged was the Stewed Mixed Vegetable in Bean Curd Parcel with Dried Oyster and Sea Moss. Unknown of what is in store when the dish was served, cutting through the bean curd exposes the variety of ingredients inside. Unlikely delicious treasures lie within! Anyway, Chinese New Year is just around the corner and to be honest, I don’t have the slightest excitement at all. How come? I’m not sure myself. I don’t even go CNY Shopping either. Yes, small bonuses given by the relatives! Strangers are welcomed to do so too! Heh. Yay!!! Ken ar.. why not buy new clothes? i am looking forward to CNY too!!! Wah!!! They let you eat free and still pay you so much kah? Hmmmm…come to Sibu, I’ll give you ang pao… LOL!!! Early loh sang to get early .. bonus..
wahhhh..fatt tatt la you, Ken!! Kak Jie dah brought 2 boxs limau mandarin frm tesco. wow so fast for the yeesang. 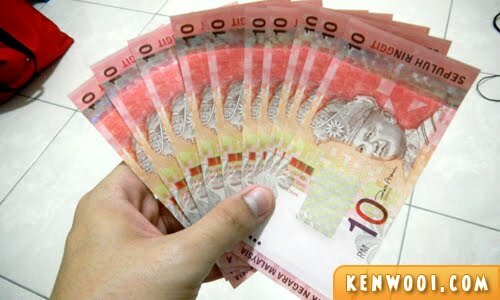 cant wait for mine :D HAPPY CNY.